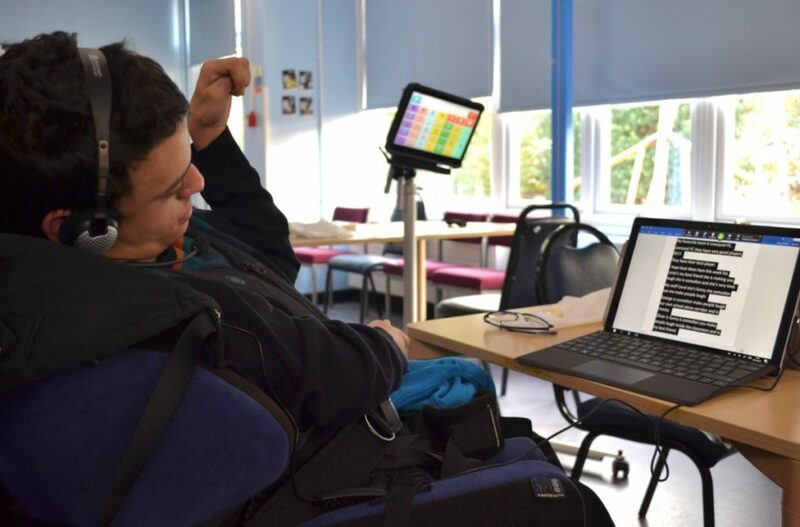 When we provide equipment to pupils we often provide software and applications which also support the assistive technology and access for the young person. Here we will provide more information about these different applications. Clicker 7 is literacy support package with a variety of tools. It has a word processor with features including speech feedback, talking spell checker, word prediction, Voice Notes and picture support. It can also be used to create talking books as well as sorting, matching, sequencing, labelling and planning activities. Free resources can be downloaded from the LearningGrids website. InPrint 3 is desktop publishing program that enables the production of symbol-supported resources for communication and curriculum access. The package includes templates to make books, vocabulary and comprehension resources, flashcards, games, rewards and many materials. InPrint 3 is supplied with 16,000 Widgit symbols and can include others images such as photos. Free and paid-for resources can be downloaded from the Widgit website. Grid 3 is an AAC package for communication, computer access and environmental control. The software allows text and symbol communication with a variety of access methods including touchscreen, switches, eyegaze and voice recognition. The program can allow control of the computer to open and use any program and the operation of environmental control devices. Free resources can be downloaded from the Smartbox website. DocsPlus is a writing support tool aimed at secondary students. The program has a word processor with a number of supportive tools such as speech feedback, a talking spellchecker, prediction, mindmaps and Voice Notes. Students can be supported further with word banks and writing frames. The software has a PDF reader that can enable the student to access written materials, such as test papers, and an Exam Mode to allow it to be used in external assessments. Free resources can be downloaded from the LearningGrids website. Penfriend is a word prediction program with a screen reader, text magnification and on-screen keyboards. The program can benefit those with spelling or gramma difficulties and users with physical disabilities. Penfriend adapts to the user’s vocabulary and can be used in different languages. First Keys 3 is an introduction to keyboard awareness through literacy activities. The program has a variety of exercises that use speech, phonics and Widgit Symbols to teach literacy skills and build familiarity with the keyboard layout. Teachers can make activities using their own word lists. Dragon Professional is a voice recognition program that allows users to transcribe speech into text. The latest version can be used without having to train the software. Dragon can be helpful for users with physical disabilities and some users with literacy difficulties. WordQ/SpeakQ writing support that combines word prediction with voice recognition. The voice recognition is not designed for continuous dictation. Rather, it helps students when where their spelling does not allow the predictor to offer the correct word. The Clicker Apps suite consists of four apps that each present one feature of the Clicker 7 computer program in a self-contained package. Resources can be shared between Clicker 7 and Clicker apps. Sentence building activities in which the student is presented with the words to make a modelled sentence. The amount of support offered through visual and/or spoken prompts can be varied. Writing activities where the student selects from a word bank to create their own sentences. Support for writing through speech feedback, word prediction, word banks and writing frames. Free Clicker apps resources can be downloaded from the LearningGrids website. An aid for symbol supported communication with speech output. Three levels of core vocabulary are included and they can be personalised to the user’s needs. The app can be used with SymbolStix, PCS or Widgit symbols. Additional free vocabulary sets can be downloaded from the LearningGrids website. Proloquo2Go is a symbol based communication app to promote language development and grow communication skills. There is a choice of vocabulary sets that can be customised to the user’s needs. Grid Player is an app that allows vocabulary sets created in Grid 3 to be accessed on an iPad. The resources cannot be edited on the iPad. Pictello is a book creation app that allows text, pictures, sounds and video to be combined into talking books. The books can be read with support from the text-to-speech facility. ChooseIt Maker 3 is a on online resource to allow teachers and parents to create personalised learning materials. Activities types include matching, choice making and multiple choice quizzes. Activities can be played online or downloaded an iPad or Android tablet. Alternative access is available trough switches. A subscription is required to create and edit activities. HelpKidzLearn is a website with a collection of games for younger children and users with severe and complex needs and learning disabilities. The activities are accessible by mouse and keyboard, one or two switches, touch and eye gaze. A subscription is needed. Individual activities can be purchased as iPad and Android apps – some are free. Dance Mat Typing is an online touch typing program from the BBC. Doorway Online is a collection of free online resources covering literacy, numeracy, time and money, typing (including a one-handed typing tutor) memory and matching.